Jordan Dental Association (JDA) is preparing for its participation in Damascus’ 19th International Scientific Dental Conference next on November 3-5, 2018. A Jordanian delegation which includes members of JDA as well its President, Ibrahim Tarawneh, are attending the three-day conference, which expects the participation of more than 6000 dentists and dental professionals. JDA spokesman, Omar Qawasmi, said that the Association’s participation in the Conference aligns with the deep-rooted relations between dental unions in both countries and with the Association’s support for the Syrian dentists in their Scientific Conference. Qawasmi pointed out that JDA has booked a bus that will accompany the delegation. JDA will also be securing all the travel’s arrangements for Jordanian participants including hotel reservations, travel facilities and transportation. 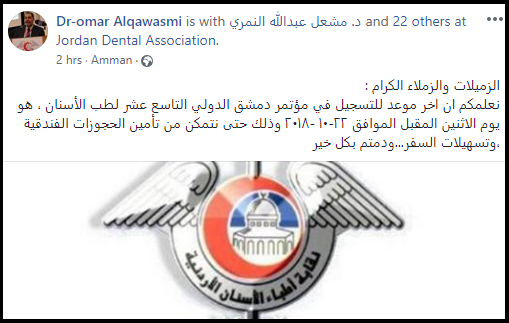 On Friday, October 19, 2018, Qawasmi announced through his Facebook account that dentists are welcome to be part of the delegation and that the deadline for registration is set on Monday, October 22, 2018.